Mini fritattas made with shiitake mushrooms, cherry tomatoes and spinach, wrapped in smoked ham and baked in a muffin tin. Accompanied by spanish style Ajillo mushrooms pan-fried on high heat with chilli flakes, sherry and paprika. Place a few glugs of olive oil in a large pan on medium to high heat. Sauté the onions in the hot oil for 4 or 5 minutes until soft. Turn the heat down to medium and add HALF the garlic and mushrooms and cook for a further 5 minutes. Remove from stove and set aside. To make the frittata batter, beat the eggs, coconut milk, almond flour, salt and pepper in a bowl. Add the mushroom mixture and the spinach and stir to combine. Oil the muffin tin and place slices of smoked ham around the sides and across the bottom of each cup making sure that you don’t leave any spaces. 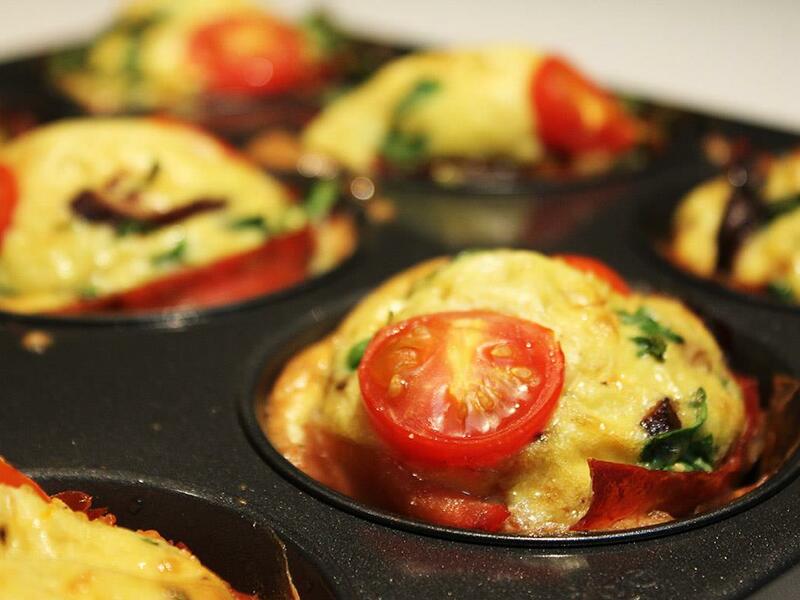 Now spoon in the frittata batter and top each muffin with a few cherry tomatoes. Bake in the oven for 20 minutes, turning the tray around at the halfway point. Let the muffins cool in the tin for a few minutes before serving. To make the Ajillo mushrooms, heat a few glugs of olive oil in a pan on high heat. Sauté the button mushrooms in the hot oil for 2 minutes, stirring constantly. Then lower the heat to medium and add the sherry, lemon juice, chilli flakes, paprika, salt, pepper and HALF the garlic. Cook for about 5 more minutes , then remove from stove and keep warm. To serve, divide the frittata muffins between the plates and serve a portion on Ajillo mushrooms on the side scattered with parsley. "This was a big hit with my family. It was easy to prepare. I did the prep work (chopping, etc) and my 11 year old daugher was happy to build the muffins for me. These muffins looked small but were surprisingly filling. The Ajillo mushrooms were delicious, but I would reduce the amount of lemon juice to let the sherry flavor shine through. " "BIt dry. Will be good with a sauce"
"The whole family loved it, but the boys wanted more food again!" "This was tasty, but I think it took too much effort for what you got. It took me quite a while to make with all the chopping involved, definitely more than half an hour"
"Not ideal as a dinner dish"
"Delicious! Something very different and very tasty indeed. Easy to prepare. Just a little short on the ham though . . . I needed a bit more for one more muffin. The recipe didn't say how many it would make . . . it made 6, but one without the ham . . . "
"Moulding the bacon was a bit tedious and then the mini muffins were sometimes difficult to get out whole. They were tasty, though and the mushrooms were great." "This one is a bit of work to prepare. Making the muffin cups out of strips of ham is fiddly, but overall the extra bit of work is worth it."